Q – Why use pre-fabricated lightweight steel trusses for roof refurbishment? A – Many different materials are used in roof construction and not all offer the same robustness, especially over time. When we are faced with a flat roof in need of a flat to pitch roof conversion the existing roof could be any number of things such as concrete deck, timber deck, woodwool, stramit etc etc. 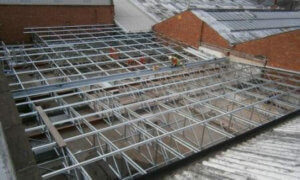 In an ideal world we would prefer to supply our dead load structure for refurbishment projects due to it being site installed and being fully site adjustable which enables undulations, plant and other items on the roof to be easily remedied or worked around without any hassle, the criteria for this would be that the existing roof is robust and in good structural condition as the weight of the structure and roof coverings would be directly on the roof. Unfortunately on some roofs the existing deck is not robust and constructed of materials such as stramit (straw board) or be in poor structural condition (rotten timbers) which will not take the load onto the roof. In these instances where the roof is not robust or unable to take the weight of the new structure and coverings onto the roof, then we would have to consider installing our Clear Span system which is either, our fully pre-fabricated lightweight truss system or, our part pre-fabricated ‘foldable’ truss system (which has been designed specifically for tight access sites). Both span from wall to wall taking the weight of the structure along with the weight of roof coverings and associated goods down through the walls of the building and no weight will be transferred onto the existing roof. All our structures come with site specific calculations and drawings, a full set of laminated drawings, plus our fixing guides and/or marking plans are always sent with the delivery to site. If you would like to discuss a project and are wondering if you should use pre-fabricated lightweight steel trusses or our site assembled structure – give us a call and we’ll talk you through the options available and which would be most suited to your requirements.